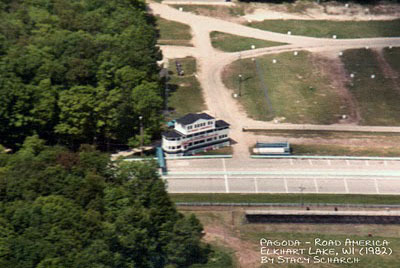 Road America's old Pagoda at Elkhart Lake, WI initially housed Race Control, Timing and Scoring, and Media operations. The timber-frame structure was built in 1955 along with the new track and was barely ready in time for the race that September. The building saw several improvements and remodeling over the years. 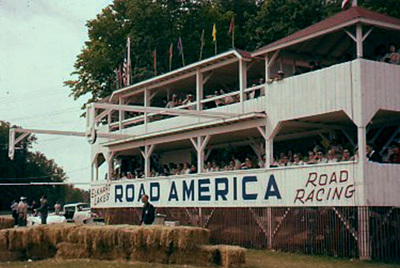 It was a major icon of Road America for 35 years, but the undersized wood frame structure outlived its usefulness and was woefully inadequate. One the floors gave way under load during a final after race party in 1989. The tower's final demise was a befitting one, and an opportunity for Elkhart Lake's fire department to use it for a training exercise burn in early 1990. Photos of the burning do exist. 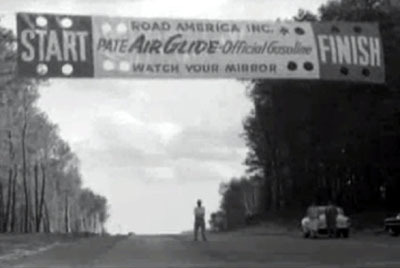 (Looking south) The first Road America Inc. Start/Finish banner near the control line. The Pagoda is off to right out of picture. The banner also endorses the track's official gasoline and reminds drivers to, "WATCH YOUR MIRROR." Photo taken before racing starts on weekend of September 9-11, 1955. The photo (RIGHT) was taken on opening day and the first day of practice for the SCCA National race. Dwight Pelkin, a Sheboygan Press sports editor, said: "They were still pounding nails the morning of the first race." A line of F-G-H Production and H Modified cars is ready to go out for the first laps on the new track. It is an exciting moment as track time nears and goes hot. Note that many of the cars are lacking any roll bars protection, as 1955 was a simpler and more dangerous time to race. View from Pagoda's second floor as a practice session gets underway late afternoon on Saturday, September 10, 1955. Cars are all lined up on false grid. The SCCA National races were held the following day on Sunday. 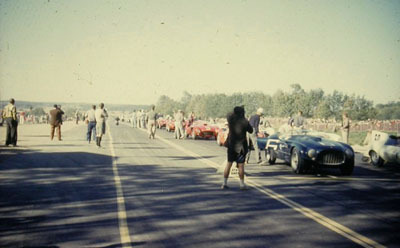 (LEFT) Cars on the starting grid for the seventh race (2 - 8 liters) for B, C, and D Modified cars on Sunday, September 11, 1955. Yet to be built is a small steel pedestrian bridge down the track near the line of trees to the right. The crossover allowed access to the competition paddock on the left, and the spectator area on right side of track in photo. By a nose... Phil Hill #3 started 4th and won the 148 mile feature race in a Ferrari Monza, after a sensational fight with the D Jaguar of Sherwood Johnston #60 who started and finished second place just 0.010 seconds behind Hill. J. M. R. Lyeth, Jr. The Pagoda with a field of cars is on the starting grid for the SCCA National race for B, C, & D Modified cars on Sunday, June 24, 1956. (LEFT) The Pagoda appears as originally built in 1955 before a roof was added to middle section. The backdrop of trees and festive nature of events make it appear like an enchanted forest. 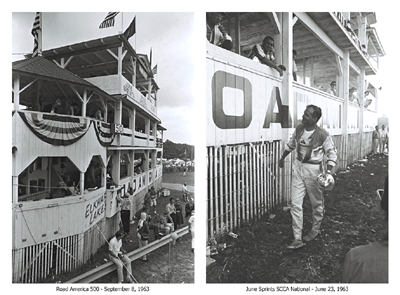 It served as a center for race communications, timing and scoring, and as a grandstand for VIPs and the press. It was eventually enclosed with windows by the 1970s. The structure and trees behind it were all cleared in 1990, to make way for expansion of the pits and paddock. The changes were spurred on by increased number of car entries and to accommodate space needed by Indy Car racing teams, as well as to comply with newer safety requirements for motorsports. The Pagoda's appearance is similar to that of nearby resorts and boathouses on the shores of Elkhart Lake. The wood frame structure and trees behind it would be cleared in 1990. Expansion of the pits and paddock was needed in order to accommodate growing interest for Indy Car racing and improved safety that would meet FIA standards. Carroll Shelby #111 completes a lap in his Ferrari 121 LM and went onto win the 1956 SCCA National race for C-Modified class and overall. A roof was added over the upper grandstand in the middle between both end towers, some time after the June Sprints. 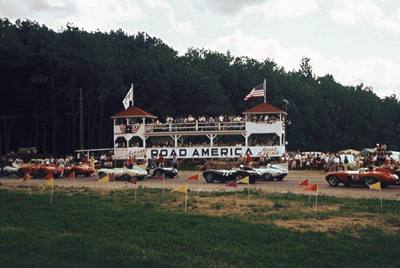 The next event scheduled a NASCAR race, the first to be held at Road America on Sunday, August 12, 1956. The photo (BELOW) shows the Pagoda's new grandstand roof in place for that race. 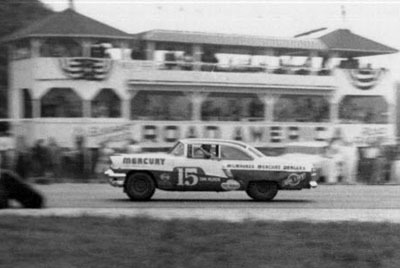 (LEFT) Tim Flock #15 drove a 1956 Mercury sedan and won the NASCAR Grand National on Sunday, August 12, 1956. The race was 63 laps, 252 miles on the 4-mile road course, and was the series' first run at Road America. 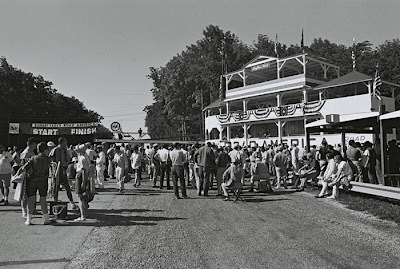 (RIGHT) The Pagoda, circa 1956, was the first communications center and overflowed with race officials, staff, the press and various dignitaries. The Pagoda (LEFT) between 1957-1958 was outfitted with two large timing clocks mounted on wooden outriggers and suspended in front for timing and scoring personnel sitting in lower level. The Road America 500 is an annual sports car race held at Road America in Elkhart Lake, Wisconsin. The first actual "500" mile-long endurance event was on September 8, 1957 and was added to the SCCA National Sports Car Championship series. In 1963, the series was taken over by the United States Road Racing Championship. The Sports Car Club of America created the USRRC in 1962. It was the first SCCA series for professional racing drivers. 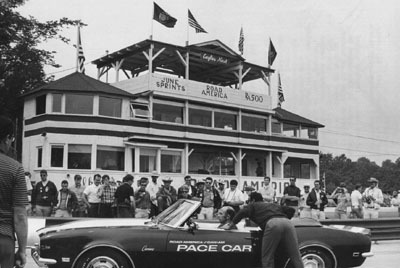 In 1968, the USRRC was abandoned in favor of SCCA's more successful Can-Am series. 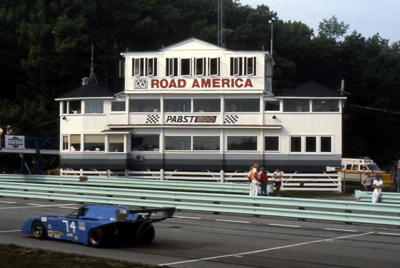 In 1979, after an 11-year hiatus, the IMSA GT Championship revived the Road America 500. In 1988, IMSA shortened the race to 500 kilometers (310 mi), and again in 1991 to 300 kilometers (190 mi). The race was shortened to 2 hours in 1992. After a return to a 500-km distance, the race was cancelled in 1994. 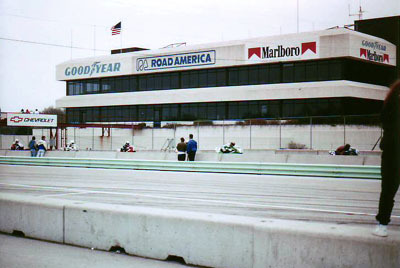 The Grand American Road Racing Championship revived the 500-mile distance once again in 2000. Since 2002, the race has been an American Le Mans Series event, and after 2003 has been a 2 hour, 45 minute race. The only two exceptions to this were in 2007 and 2008, when 4 hours were scheduled. Porsche has won the event nine times, most recently in 2007. Augie Pabst, Chuck Parsons, and Geoff Brabham have each won three times as drivers. 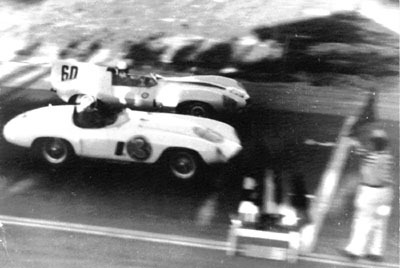 (RIGHT) In capable hands, Briggs S. Cunningham #62 driving his 1958 Lister Jaguar XK L6 3000 cc in the 500-mile race. A film camera is mounted above the instrument panel and pointed at the driver. The #60 car in front is teammate Walt Hansgen driving a 1960 Jaguar E2A Le Mans Sports-Racing Two-Seater Prototype. The start/finish line is shown before there was an overhead flag stand for starters. Photo (right) from the dash mounted camera with legendary driver Briggs Cunningham at the wheel of his Lister Jaguar. His car has just passed the start-finish line near the Pagoda shown over his shoulder. 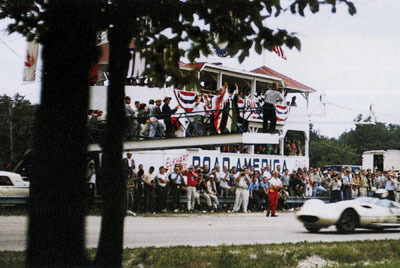 The Road America 500, SCCA National Sports Car Championship race September 11, 1960. 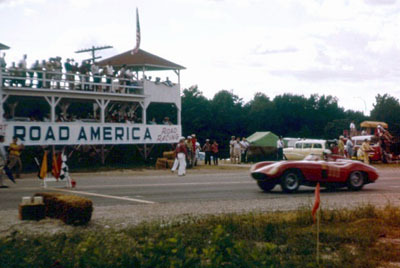 (LEFT) The Road America 500 on September 9, 1962, a year before the Pagoda's third floor addition. Checker is waved for Hap Sharp as he finishes 500-mile race at speed. The Cunningham transporter is in background, one of the first big rigs to be used. The flag stand was added between 1960 and 1962. Race starters were moved from harms way on the track surface to the cantilevered platform above next to the start-finish line. About the same time, The two timing clocks were inverted (upward) for timing and scoring workers moved to the Pagoda's second level. It's a great day for a racing. Gathering for early morning drivers meeting at the 1963 June Sprints SCCA National. The Pagoda is showing a new third floor. There's a new starters flag stand (just above heads) between the start-finish banner and race tower. The gravel/dirt hot pits are in foreground and were eventually paved. In 1963, the Pagoda saw the addition of a third floor called the Eagle's Nest. More space was needed for race officials, stewards, communications staff and timing and scoring personnel. Ample counter space was needed in the days before computers and transponders. There were over 20 assignments for T&S personnel when timing and scoring was performed manually. Third level Eagle's Nest and workers below. Photo from flag stand above track at 1963 Road America 500. Driver in front of Pagoda carrying a trophy cup before volunteer workers and announcer at 1963 June Sprints. (LEFT) The Pagoda with third level Eagle's Nest and flags flying above. The turret on left is shown partially glassed in on the second level. The fourth car on the starting grid is a young 24-year-old Jerry Hansen in #44, a maroon McKee Mk II Chevrolet. The Road America 500 on Sunday, September 5, 1965. 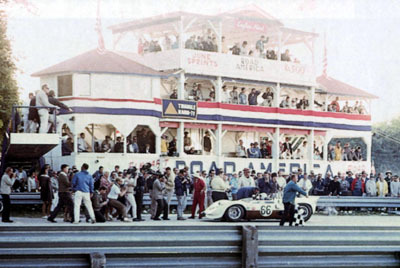 (RIGHT) Ron Hissom #66 in a Chaparral 2A stops in front of the pagoda to pick up the checkered flag for a victory lap at the end of 500-mile race on September 5, 1965. The team of Jim Hall, Hap Sharp and Ron Hissom took turns driving 125 laps on the 4-mile circuit in 5-hours 35-min. and 6-sec. with an average speed of 89.53 mph. 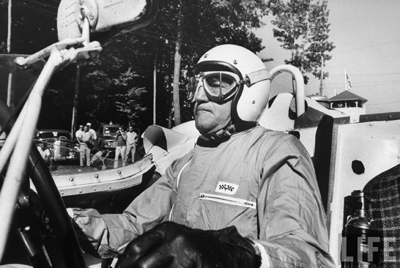 The race was stopped on lap 16 after a collision between Jack Ensley in his Apache special and Clint Lindberg driving an Elva-BMW, which caught fire. The cars blocked the course and stopped the race until the track was cleared. After an hour and 14-minutes the race was restarted. 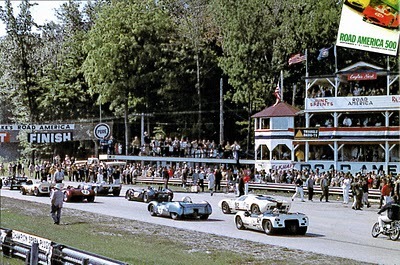 It was one of largest attendance draws in Road America's first decade. (LEFT) Gradually, the pagoda received more windows. It also created ventilation issues for those working inside on long hot weekends. That's British driver Stirling Moss in the pace car at the wheel of a 1968 Chevrolet Camaro Z/28, for the Can-Am SCCA race on Sunday, September 1, 1968. 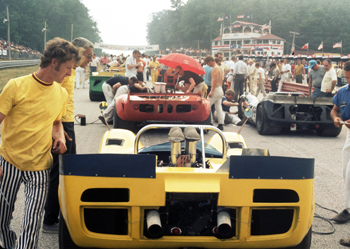 (RIGHT) A yellow McLaren M6B and other sport racers are lined up on the starting grid, awaiting start the start of the SCCA Can-Am championship race on August 31, 1969. The Pagoda and start-finish line are together in background. 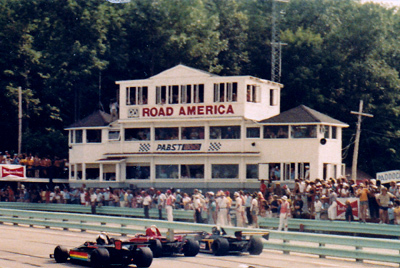 The Road America 500 race was discontinued the same year and didn't return until 1979. The iconic red roof was replaced with charcoal color shingles after 20-years. Gone are the red white and blue banners as seen in older photos. The glassed-in building, charcoal shingles and fresh white paint gave the building a more official appearance, less celebratory than what was mostly been a nationalistic theme. The CASC North American Formula Atlantic Series Race on July 22, 1979, showing start. The Pagoda began to look more serious as a control building with tall radio tower, completed window enclosure and dressed up appearance. Following the building's updates, the flags which once decked out the roof were no longer flown and were replaced by tripod antennae and communications tower. (RIGHT) The Pabst 500 race weekend on August 21-23, 1981. 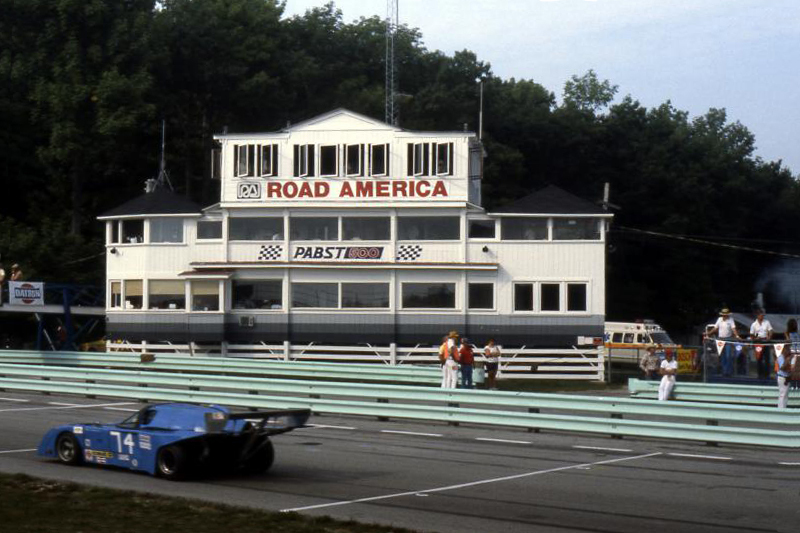 Passing in front of the Pagoda is Janis Taylor's #74, in a blue 5.4 Chevron Buick 36, GTP class purpose-built prototype. A "Pabst 500" banner is hanging above the first floor windows. Pabst Blue Ribbon beer was the event's title sponsor for a few years. Originally, the 500-mile was conducted by the USRRC. The United States Road Racing Championship was created by the SCCA in 1962. It was SCCA's first professional racing series, which ran until 1968. The IMSA series was founded in 1969 and racing debuted in 1971. (LEFT) Aerial view of the main straight, pit lane and start/finish in front of Pagoda. 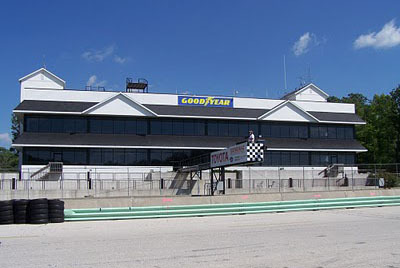 A blue starters flag stand is suspended above the track on left end of building. The competitor's paddock with electrical hookups is in background. It was a perfect day for a flyover and some aerial photography. We took off from an outlying airport near Madison, WI on route where we encircled Road America then landed for lunch at the Manitowoc airport in Jim's two-seater Cessna 150. This is one of a few photos I took of the 4-mile track with my 35 mm Fujica MPF105X with an 80-200 mm zoom lens. My regret for not loading camera with slower film, instead of grainy high-speed ISO 400, which I used for capturing speeding race cars. 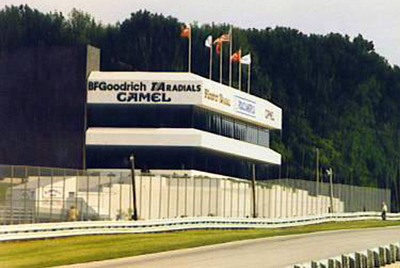 (RIGHT) Looking south about 1987, down the main straight in direction of cars, the start/finish banner, starter's flag stand and Pagoda. The new control building is out of view on left side of track. Beer brewing sponsor changed from Pabst to Miller (red banner) between first and second floor windows. In this photo a new banner and race sponsor Miller High Life is above lower level windows. Pit lane is on right side of aqua colored Armco and enters onto track just after Pagoda. Pit lane was almost doubled in length after removal of the Pagoda in March 1990. The 1987 Bendix Trans-Am Race #8, Living Well/Provimi 200 Weekend at Road America was on Saturday, August 29, 1987. The race was 25 laps on the 4-mile circuit for 100 miles. Newman started 6th on the grid. 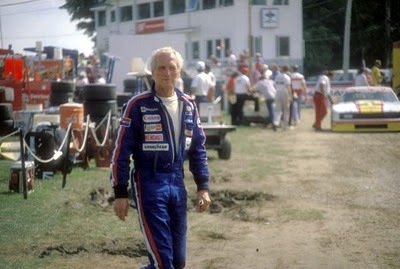 (LEFT) Driver/actor Paul Newman walks through the paddock from the pit area just before the start of the SCCA Trans-Am race on Saturday afternoon of August 29, 1987. Deborah Gregg's Mercury Capri is in parked in background near the Pagoda. There were two qualifying sessions on Friday with a second on Saturday. Newman crashed three hours earlier during the second qualifying session when he spun out in the Carousel between turns 9 and 10. 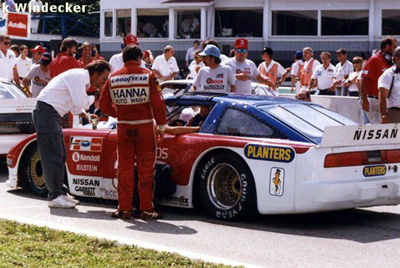 The Newman/Sharp Racing team got the #33 Nissan 300ZX Turbo (LEFT) repaired just minutes before the race. Even though he qualified fastest at 106.94 mph, "PLN" started sixth because of a previous slower run during a wet session on Friday. Newman's #33 Nissan ends up going sideways off course. Saturday's race got off to a very ragged start with cars out of position. Deborah Gregg began making an inside pass in her Capri and drivers didn't get a green flag on the pace lap. During the false start, Newman crashed when the engine blew on his Nissan 300ZX Turbo and sent him off course before reaching the start/finish line. He was out of the race before it started, on what was still a pace lap. The video clip (LEFT) includes a brief follow-up with PLN shortly after the incident. The layout of Clif Tufte's remarkable 4-mile circuit followed along the Kettle Moraine's natural topography and transformed the site into an enchanted land of racing. The world-class racing circuit is a hidden jewel in Wisconsin's backyard. The track is well regarded and revered by top drivers, race teams and legions of fans that attend. (LEFT) The Miller High Life 500 (kilometers) IMSA Camel GT weekend was July 14-16, 1989. 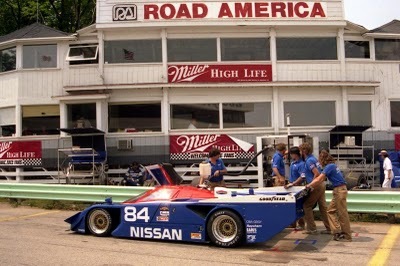 In front of the Pagoda is a Nissan GTP ZX-T (Grand Touring Prototype) car being fueled. Car #84 was driven by Geoff Brabham (AUS) and Chip Robinson (USA), but did not start race. The team's identical backup car #83 was piloted by same drivers, and won the endurance race. In 1988, the annual Road America 500 endurance races were shortened from 500 miles to 500 kilometers, about 310 miles. One of the last photos of the Pagoda in its final days, before the 34-year-old wood frame building was removed. The building was a fond familiar site to everyone at Road America. More space was needed for a longer pit lane and larger paddock. The press couldn't wait to take up residence in the facility being planned for on the opposite of main straight. Mary and husband Ade Mullen were active members of Land O' Lakes Region SCCA since 1958 and volunteer workers through much of the 1990s. 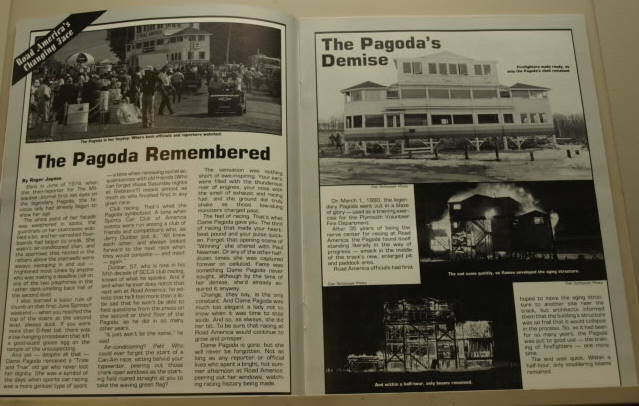 This is an excerpt from the region's newsletter and an account of what it was like to work inside the Pagoda. "Mary and Ade also worked the Media Room at Road America for 13 years, including moving from the Pagoda to the new control building. She and Ade both remembered the stormy afternoons when they’d be finishing cutting stencils for the mimeo to copy the results, with Mary supervising a crew of a half-dozen women while Ade called the media who were not present at the track. Often, they could feel the Pagoda sway in the wind, and sometimes a window would blow out, but they kept working." The old Pagoda literally went out in a blaze of glory, when local volunteer fire fighters used it as a training exercise. The twin turreted Pagoda possessed character and charm on the outside, but less so for occupants working within. Structurally, it was barely adequate and from the beginning was often overloaded with occupants and beehive of activity. The mostly post and beam structure saw some renovations over the years, most notable was the addition of a third level dubbed the Eagle's Nest. It was transformed from an open-air shelter to a fully glassed-in building. The Pagoda purpose and longevity went beyond what many must have expected. Calls for the wrecking ball were being heard. 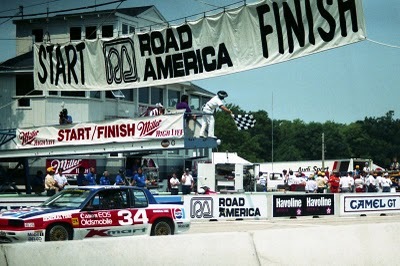 The time for change was ripe for Road America in the mid 1980s, as 30 years of highly successful race events proved. Like Clif Tufte's vision for the racing circuit long ago, the same attention to the track's future was paramount. 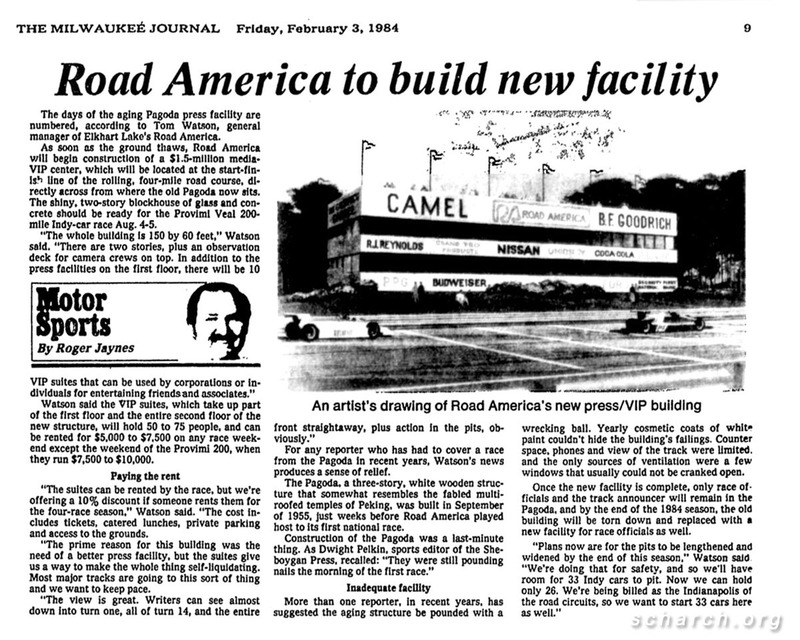 In the spring of 1984, Road America began construction on a $1.5-million VIP Tower/Media Center, which was located at the start-finish line directly across from the old Pagoda on the main straight. The new two-story facility was built of concrete, brick and glass measuring 150-feet by 60-feet, and had a rooftop observation deck for camera crews. 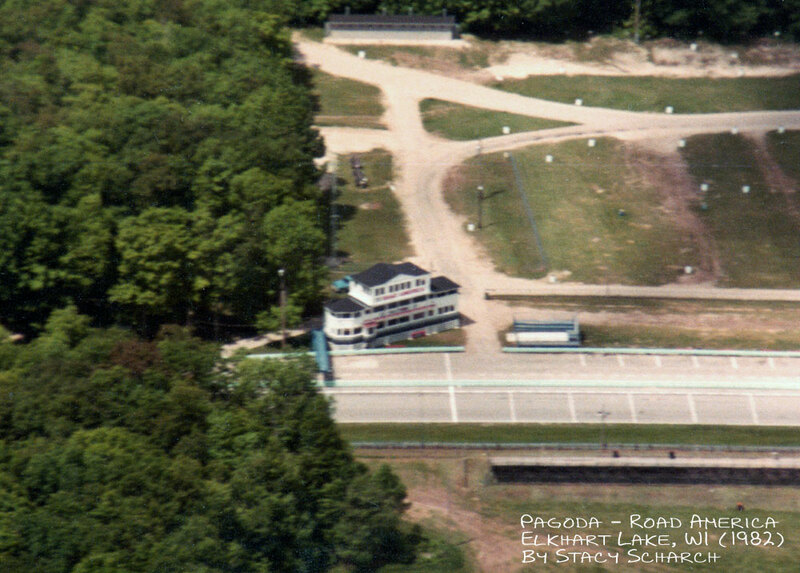 Once the building was complete, only race officials and a track announcer continued using the Pagoda. There was another phase of development in the works. The track was experiencing growing pains. Pit lane needed to be widened and lengthened to allow for the increasing number of race entrants and bigger field of cars. Also, the competitors paddock overflowed with cars, trailers and tow vehicles and began sprawling outside to other open areas of the track. Standing in the middle of the path for the new pit lane was the Pagoda and about 10-acres of dense trees, which resembled a small forest. Both had to go if the track was going maintain its function and relevance in motorsports. inside the 1990 Road America IMSA race program. The building that oversaw 35 years of amateur and professional road racing was slated for removal in the upcoming winter. At the close of 1989, there was a final tribute at one of the last races. Like an Irish wake, a party was held by workers and staff to bid farewell inside the old Pagoda. By one account, a section of the floor gave way as the result of all attending. Nobody was injured, but revelers were almost certainly reminded why the shoddy building had to go. On the cold evening of March 1, 1990, volunteer firefighters from nearby Elkhart Lake gathered for the purpose of training exercise and set the Road America icon ablaze. Like a great bonfire, the Pagoda went up in flames; its wood frame glowed in the cold darkness of the winter evening. 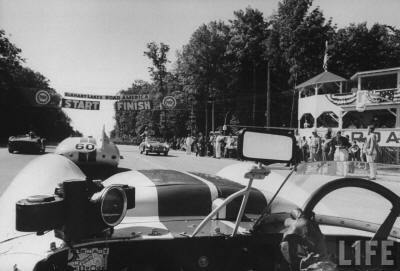 Forty-years prior, Elkhart Lake's Fire Chief worked with Clif Tufte and others to bring road racing to Wisconsin, where it has remained since. 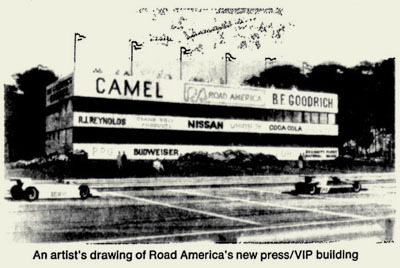 (LEFT) Architectural perspective rendering of Road America's new press/VIP building and The Milwaukee Journal write-up by Roger Jaynes on Friday, February 3, 1984. (RIGHT) Photo of VIP Tower/Media Center taken about 1987. It sat across the track opposite the Pagoda on drivers left. A new and more modern race control building was built in 1984. It was located on the opposite side of track from the Pagoda at start/finish line. The new building served chiefly as a VIP/Media center at first, while the old Pagoda remained in operation to accommodate race control and timing and scoring operations until the end of the 1989 season. The new facility did not have a starter's flag stand until 1990, after the Pagoda was gone. 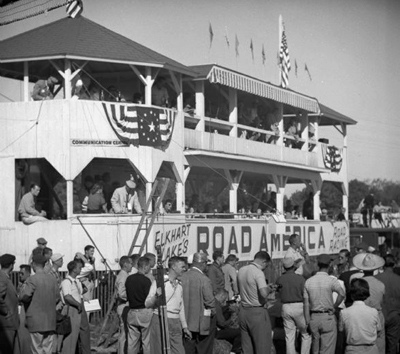 The VIP Tower/Media Center also housed race officials and was also known as the RC, or race control. The design was a popular form applied to commercial buildings in the 1980s. The new tower bears resemblance to a WWII machine gun nest. Function is one thing, and form another. There is a lot of concrete in this photo. The photo (left) was taken about 1995 when the building was already ten-years-old. You can some minor rust stains at the base plates for the flag stand. (RIGHT) Photo of race control building taken from pit lane at 1:36 pm on Saturday, August 16, 2008. 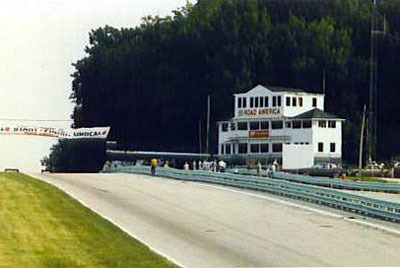 The first makeover to Road America's second control building had been completed by 1999, just 13 years following its original construction. The theme pays homage to the old Pagoda, and follows suit with Road America's rural branding as it is applied elsewhere on the track. The latest dress-up is definitely more fitting and less inhuman. Road America is a world-class racing facility and one of the best in the country. "America's National Park of Speed," is proudly displayed on a large billboard at Turn 5. But then, Clif Tufte had already envisioned that by 1955.